It’s a collection of workflows and technology solutions that connect and collects all data from your business marketing and sales activities. 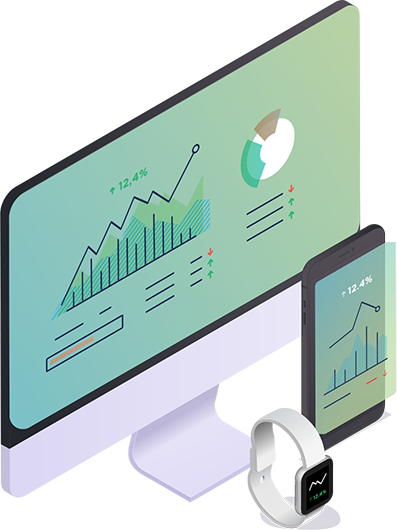 It provides an end to end reporting, process management, goal tracking and intelligent performance tracking and alerts for all of your business KPIs. It puts you in the pilot seat to manage your team and the outcome. How does it help with outcome? 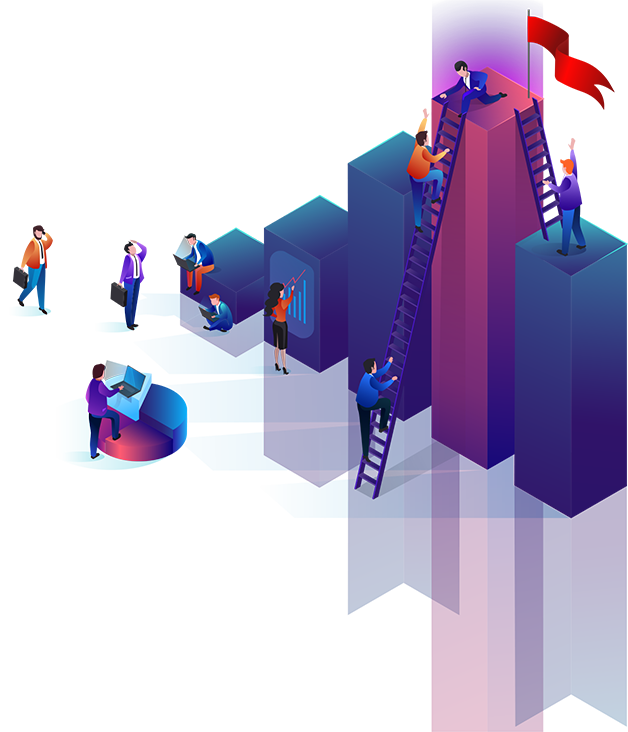 By creating an environment where everyone feels in control of the company’s performance next week, month, quarter, and beyond, all through a predictable performance workflow. Most companies can't predict how they'll perform next month, quarter, and beyond. Today, everyone has access to more performance data than ever before. But, it is inaccessible to most people because it lives in so many places – behind so many apps, logins, passwords, and screens. This makes everyone’s job even harder. Especially yours. Often times, you might be unsure how your work directly influences performance, or which activities you and your team should be doing in order to move the needle. That’s why it’s so hard to communicate the value of your work to others – your boss, your team, or your clients. Think about it – you’re probably routinely logging into 12 different apps to track performance and see how things are going, but you’re only seeing pieces. Then, you have to piece those things together by taking screenshots, downloading CSVs, copying and pasting data from all the tools you’re using into spreadsheets and slide decks. By the time it’s presented to others, it’s already outdated and usually too late for you and your team to act on it. So, like most people, you default back to the things that mostly worked for you in the past, or rely on your gut. The reality is that most companies are striving for general performance improvements. But the world is moving too fast to continually rely on general improvements. To achieve predictable and meaningful improvements, you need to change your approach. Predictable Performance is about creating an environment where everyone feels in control of the company’s performance next week, month, quarter, and beyond. One where everyone knows the impact of their work towards the company’s goals, and more importantly, is able to use that information to improve performance tomorrow. Where instead of goals being static, they’re set monthly to inspire short-term action. Where adjustments can be made on the fly in order to stay the course and make progress. Where real-time monitoring allows everyone to stay focused on the most important activities, identify the ones that produce the best results, and feel empowered to adapt their plan as needed. Where everyone, across an entire organization, will know how their work directly influences performance and is in control of the company’s performance next week, month, quarter and year. With Predictable Performance, you don’t need to spend hours digging around for the insights you need. It isn’t dependent on monthly or quarterly reporting meetings, or cut-and-paste and out-of-date spreadsheets and slide-decks. Instead, because everyone knows the status of initiatives, progress towards goals, and the activities that drive results – everyone is able to make the adjustments that improve performance. What would it allow you to do? 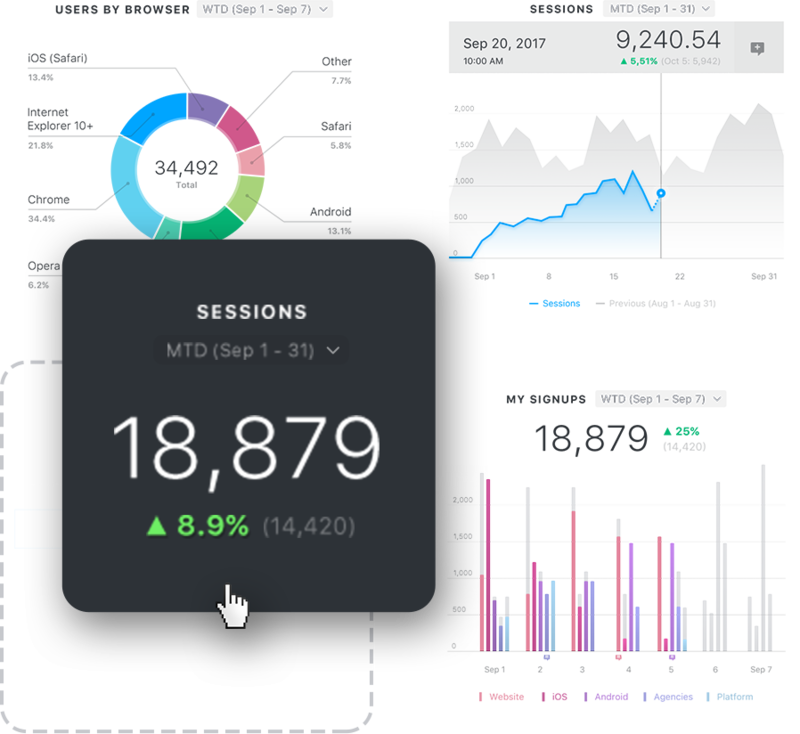 A flexible dashboarding interfce that works across all devices, your team can pull the metrics they need, visualize KPIs in a variety of ways, and build beautiful dashboards–no code or design skills necessary. Want to track multiple sources, like marketing, sales and financial performance data all in one place? You can add data from 60+ data sources without the need for an ETL developer. Easily view and report important KPIs across your organization in a single glance. Use a wizard or a blank canvas, either ways it takes minutes. 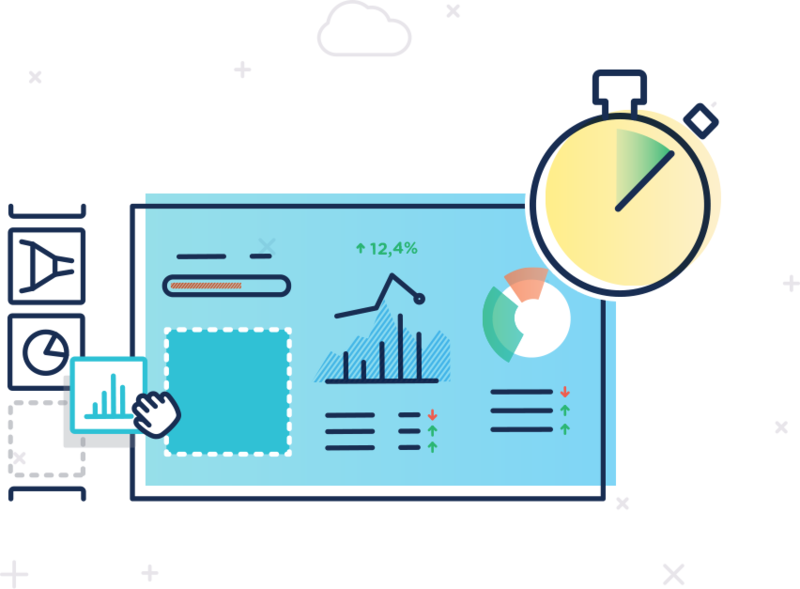 You can connect a data source, choose important KPIs to track, and visualize all of it in a custom dashboard in minutes. Using the Datablock Library, you can easily drag-and-drop the most popular visualizations for any metric from any data source right into your dashboard. These blocks have metric(s) pre-configured with common visualization types like tables, number blocks, and line, bar, and pie graphs (to name a few.) Simply drag and drop them into your dashboard and the data populates automatically. Select different visualization types – tables, line graphs, bar graphs, number blocks, gauges, and 13 more – for any metric; pick from available time intervals including today, yesterday, this week, week-to-date, month-to-date, this year, and many more; compare current performance to the previous time period or a year ago; add goals, trend lines and averages – all without writing any code. What else can you do with your data? There are multiple ways to get your data into the system. Connect via any of our 65+ integrations, build custom metrics, connect a SQL database, send via API, and more. The quickest (and easiest) way to visualize your data is through any of our 65+ integrations. These integrations come loaded with thousands of default metrics, as well as hundreds of pre-configured Datablocks and 200+ pre-built reports that can be setup in minutes. Sometimes the preconfigured metrics from the tools we use aren’t enough. 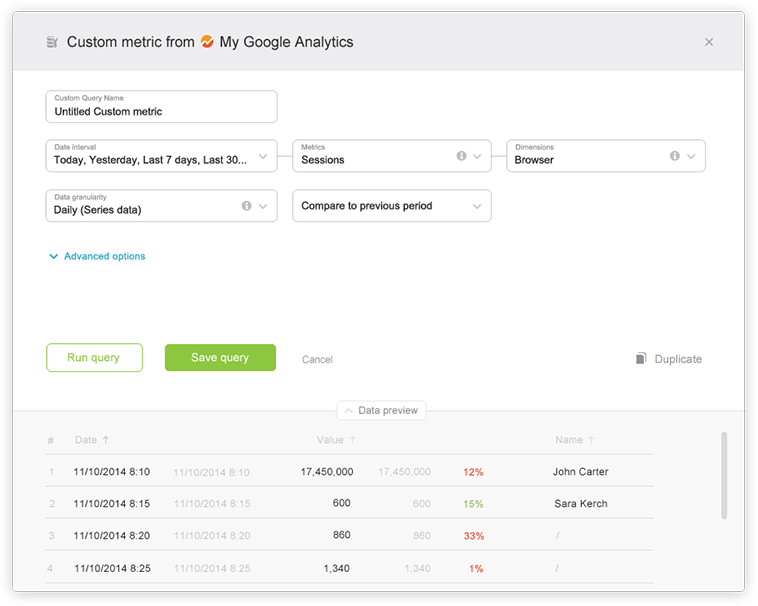 With Query Builder, you can use dimensions and filters to build custom metrics that allow you to pull more granular performance insights. Now, anyone can build the specific metrics they need without any engineering work. 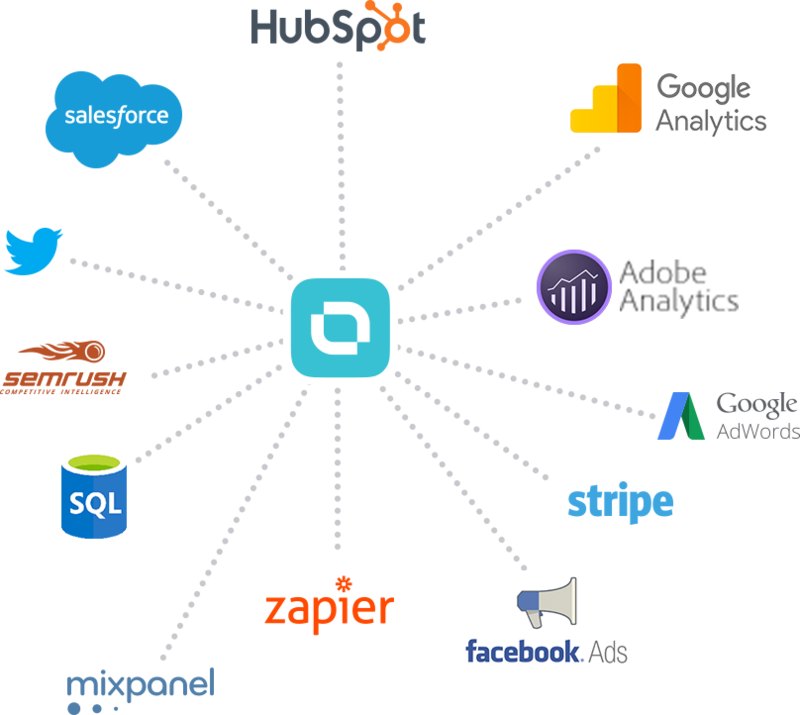 Query Builder works with: Google Analytics, HubSpot Marketing, Facebook Ads, Google AdWords, LinkedIn Ads, Salesforce, Prosperworks, Zendesk, Mixpanel, Adobe Analytics, Localytics, iTunes Connect, BigQuery, and Snowflake. Connect a SQL database, then write SQL directly to create metrics that can be visualized in the Designer. Connect with your data from inside PostgreSQL, MySQL, AWS Redshift, Microsoft SQL Azure, Microsoft SQL Service, Google BigQuery, Elasticsearch or Snowflake. Do you have a development team? or do you run a SaaS company, your developers can pull data from anywhere - on or off the cloud -- and push it into the platform. Send the platform your data on your own terms and times. The API is safe, fast, and simple, and we have multiple SDKs to help you on your way. How much would it cost your business? Not everyone has the budget of a Traditional BI solution and the marketing budget of one. Performance BI is priced with Start-ups and SMBs in mind, businesses that want to have access to their data today. We offer three types of pricing to match your business needs. The price for each covers the implementation cost and one years licensing of the software. Thoroughly report results and eliminate cutting and pasting. Advanced reporting and analysis for agencies serious about improving results.